The Australian countryside has allured many an artist but what makes James’ vision different? Very recently paintings delivered to the gallery unframed, simply rolled up emphasised the oneness he has with the bush and its rawness. Out of necessity with the immediacy and desire applied to the art surface, his painting captures ageing, harshness on one hand yet a softness, a mystery to the landscape surface all directed at the viewer. It is like telescoping into one layer of the paint surface then exploring more at a further depth and so on! This process almost overrides the focus of the subject. Singular compositions, a portrait, animal, or bird amongst other subjects have been his focus. The rawness of his work is where the true treasures of the artwork lie! “I get involved with patterns and a texture that is there but not paint dimensional. It’s almost like peeling away layers of the landscape to expose another effect.” James says he will employ any means to achieve the desired effect- dirt, small stone, dust, wire scratch. What’s around me will augment the paint often employing a liberal exposure of the canvas texture in his oil paintings. Colour is another element of Kearns’s painting that one observes, or rather the lack of it! Natural tones are set against contrasts which seem to draw the viewer to paint effects playing down the central composition overall. It has strength and yet subtlety. Underplay could be a word to describe a Kearns composition. So what would you expect to see with a Kearns painting composition? Firstly he must have developed an emotional attachment to a subject. I asked him on our recent trip to consider painting a bear, he said he would love to paint a bison but wouldn’t, he says he hasn’t seen the animal, so he can’t form a connection to paint one! There is no better example of the relationship with a subject to paint than that of ‘Fridge’. 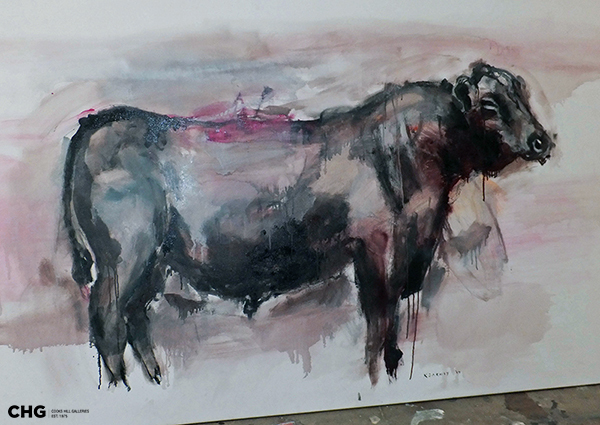 A gigantic bull standing in the shed where James would paint during the middle of 2013. In this instance his association with the bull turned into a companionship. After 2-3 months away from the farm where ‘Fridge’ lived we went back to that same farm recently so I could gain further insight to James’s painting experiences. We couldn’t find ‘Fridge’ presuming his time had come! Whilst there, we walked over to the back paddock to a small dam, noticing the water levels were down. Disguised near the water’s edge was a bull’s skull decomposed (not Fridge’s though!) James was immediately excited about his find and back it went to his studio in town. We took a photo of the skull concealing James’s head, set against a background of the almost white clay dam wall with pearly white water against a dramatic deep blue sky. What a photo! I liked it so much so it went on Facebook of course, uplifted on the 20th December 2013.Check it out! Kearns is fascinated with transformation, growth and development of the human or animal. The ‘life cycle’ and understanding it suggests is a need and a fascination. As one reflects on life, I noted thought lines from James in artworks that revealed to me his own life’s story! One work in particular has a young boy looking across to a middle aged man. The perception is James as a boy looking across to what he has become in the future. No evidence is given with dates or whether it is a record of now looking back to his past Or the boy looking to the man as he is today, a 32 year old. Does it matter? Perhaps not, but this artwork was found on the dark side of the farm’s shed or what we might suggest is the thought provoking aspect to James Kearns’s life. 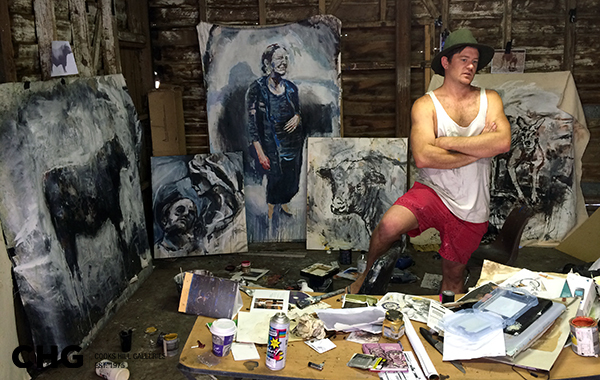 Ben Quilty has indicated to Kearns he needs to draw on his feeling from within, to form future painting compositions. He recognises his significant life experiences need to surface, making great future paintings. To James this is a transitional process and one he cannot apply himself on demand. He realises it will take time and a combination of internal and external forces to align! If it’s emotional and life cycle influences that need to surface, James imminent father role is most likely to be a catalyst for an outpouring of emotions in 2014. Lets watch this space as they say, James is on the cusp developing into the destiny that lays in front of him. In the meantime the inspiration and subject matter for this artist is rural and for this forthcoming exhibition on February 14, 2014 at Cooks Hill Galleries, Newcastle’s premier art gallery, James has his head down and has been working hard with less than 2 months to pull the exhibition together. All very exciting especially when the opening night will be a colourful event. A combination of old friends from school days, country friends and gallery followers – what a mix! So please join us for the opening, it is mandatory for us urbanites for many reasons however if not just to keep up with the country folk!!! I think I will need a few beers on the ready.